Please Help Us Finish the Job! Navarro-by-the-Sea Center (NSCR) is a small all-volunteer 501(c)(3) nonprofit working with State Parks to save the two remaining historic structures of the original town of Navarro at the mouth of the Navarro River, and reopen them for public education, interpretation, and research. While the original town of Navarro has long since vanished, largely abandoned, the historic Captain Fletcher’s Inn (ca 1865) and the Mill Superintendent’s House (ca 1864) somehow survived while the rest of the town was reclaimed by floods, fires, and earthquakes. The Inn remained in the Fletcher family operating as an Inn for travelers along the coast until they sold the property in 1926. The Inn then operated as a road house through a series of private owners, eventually becoming the popular Navarro-by-the-Sea as automobile travel increased. Eventually the Inn fell into disrepair and was closed by the mid-1980’s where it then suffered severe neglect. The Inn and Mill House were eventually acquired by the State and became part of Navarro River Redwoods State Park by 1996. NSCR was formed in 2001 to work in partnership with State Parks, but lacked the funding necessary to make the critical repairs, and by 2010 the Inn was on the verge of collapse. Thanks to major grants from the California Cultural and Historical Endowment (CCHE), Mendocino County, the Community Foundation of Mendocino, California State Parks Foundation, Savings Bank of Mendocino County, and other generous private and public donors, we’ve been able to navigate the complex 10-year permitting process and the expensive construction process to stabilize the Inn. This included preparation of comprehensive management guidelines for the Navarro-by-the-Sea area, securing National Register Nominations for both the Inn and Mill House, and preparation of architectural drawings to stabilize the historic Inn. In 2012, thanks to an outpouring of support and a generous construction grant from CCHE, NSCR was able to initiate the critical stabilization work on the historic Inn. Completed tasks included demolition work, hazardous cleanup of asbestos and lead, a new perimeter foundation and front porch, earthquake structural retrofitting, repair of the siding and repainting, installing wood sash windows, performing lead paint abatement, and sealing up open walls on the ground floor. 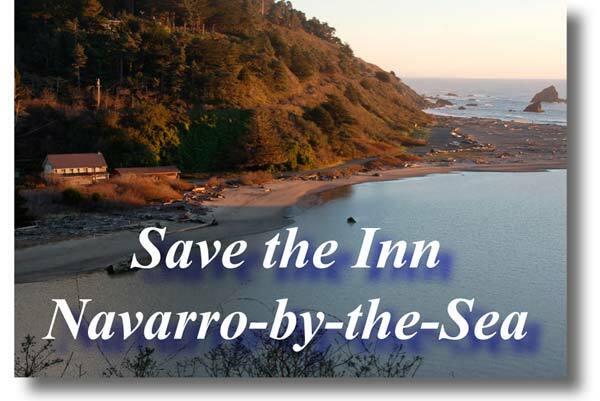 Click on this PowerPoint link to see a brief history of Navarro-by-the-Sea, the progress NSCR has made over the past decade, the condition of the historic Inn before construction began in 2012, and photographs of the construction work accomplished since 2012 and its current condition! 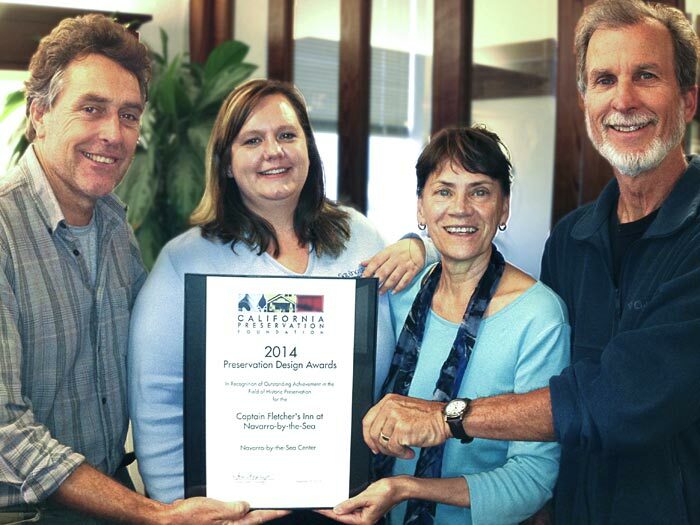 In September 2014 the Inn Stabilization Project received the 2014 Preservation Award from the California Preservation Foundation, and in November the 2014 Governor’s Award for Historic Preservation. These are the two highest honors in historic preservation given in California, and the only award in historic preservation awarded by the State. 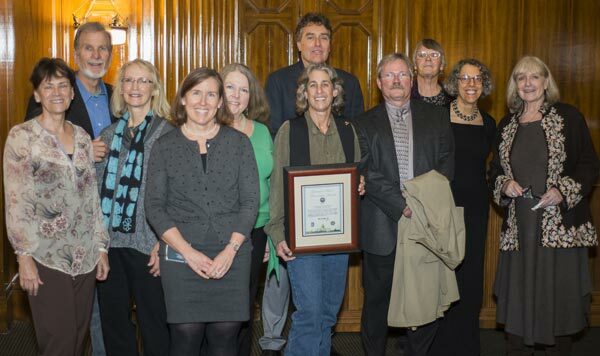 They were given in recognition of the important preservation efforts in saving part of California’s history, and the strong grassroots effort and partnership with State Parks during challenging financial times that made saving the Inn possible. We’re honored that our collective efforts to “Save the Inn” have been recognized by the California Preservation Foundation and Governor. Nancy Goldenberg, Principal, Carey and Co.; Carol Roland-Nawi, Sate Historic Preservation Officer. We still have a ways to go to complete the full building renovation and interpretive displays for the historic Inn. This includes funds needed to install a permanent roof, completing interior renovation, rebuilding the fireplace, restoring most of the original upstairs windows, and providing interpretive displays and exhibits to share the rich cultural and natural histories of the Navarro-by-the-Sea area. Please help us finish the work necessary to “Save the Inn” and donate your tax-deductible contribution today. Or, contact us at 707/877-3477 if you have a construction-related skill or building materials that you think we could use as an in-kind contribution. We’re almost there, please help us reach our goal of saving the Inn and reopening it to the public to share our rich histories. Please make checks out to “NSCR” with a notation to “Save the Inn Fund” and mail them today to NSCR, PO Box 1710, Mendocino, CA 95460.
with food, drink, live music and fun after more than 30 years!